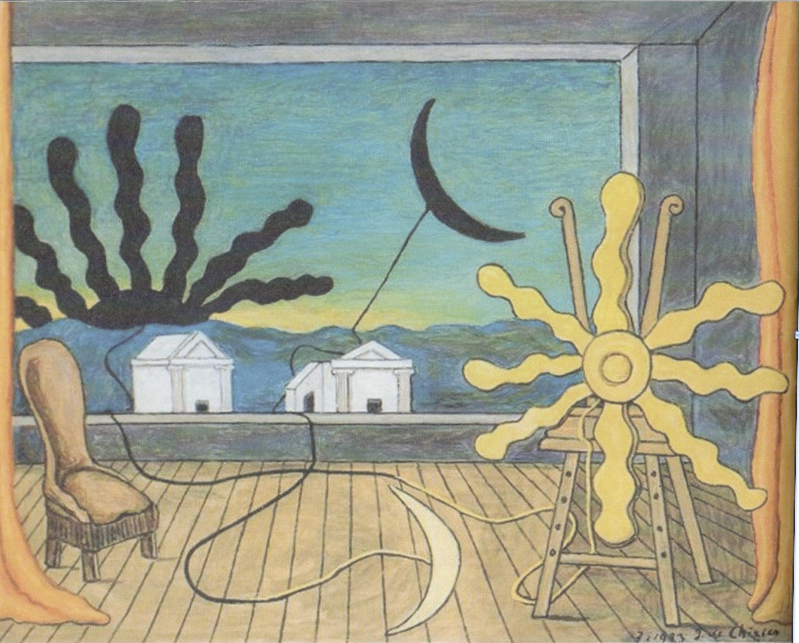 In this canvas, Sun on the Easel, the theme of insight and out-sight is clearly apparent as he places a glowing sun (representing exterior sight) and a bright moon (interior thought) inside his studio with their darkened counterparts outside. By themselves the sun and moon had long represented both forms of perception but, here, he doubles them, placing both bright inside and both dark outside. 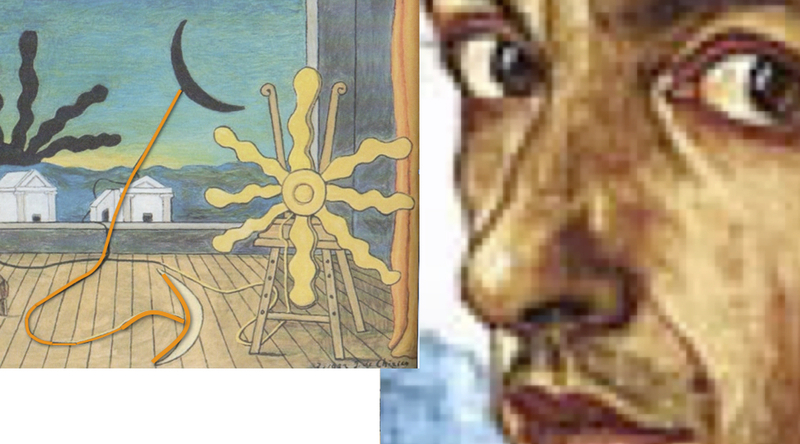 He suggests, as artists often do, that the window in the background is a framed painting. We are looking at how his imagination inside the studio transforms into a landscape painting outside. 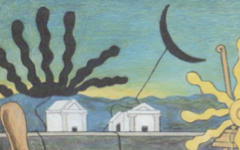 Landscape in art, De Chirico says here, is not a copy of the exterior world, as the ordinary viewer naturally thinks, but a reflection of the artist's mind. It is what Chinese artists sometimes call a Mindscape. Meanwhile the two darkened entrances to the two white temple-like structures seem to suggest "eyes" peering over the top of the window ledge, as indeed they are. Entrances and the verb "to entrance" are linked as they are here. 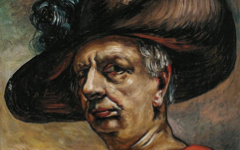 They are the "eyes of Chardin" as you can see in a sequel to this article, De Chirico's Sun on the Easel, Part 2. Original Publication Date on EPPH: 21 Jun 2011. © Simon Abrahams. Articles on this site are the copyright of Simon Abrahams. To use copyrighted material in print or other media for purposes beyond 'fair use', you must obtain permission from the copyright owner. Websites may link to this page without permission (please do) but may not reproduce the material on their own site without crediting Simon Abrahams and EPPH.